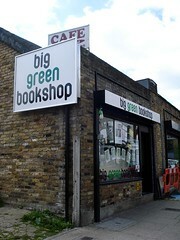 The Big Green Bookshop was a friendly independent bookshop in Wood Green. It closed its physical premises at the end of January 2019 and moved to online only. Kake has visited quite a few times now, most recently in September 2010. The owners are both very friendly, and willing to have a chat if they're not busy. They have a small but good SF section, and a somewhat larger fantasy section. There's also a separate London section, with local history books as well as general London books. They also have the usual fiction, children's books, etc, and in mid-2011 they added a second-hand section too. They run quite a lot of events, including "meet the author" type things, reading groups, quizzes, writing workshops, etc. If you don't see what you want on the shelves, they can get most titles within 24 hours; and they also have an out-of-print book search service. You can also order books online via their website; postage is free, and payment is via PayPal. Accessibility: A rather high step up to get in. Last visited by Kake, September 2010. Last edited 2019-02-01 16:48:47 (version 13; diff). List all versions. Page last edited 2019-02-01 16:48:47 (version 13).